creative savv: This week . . . 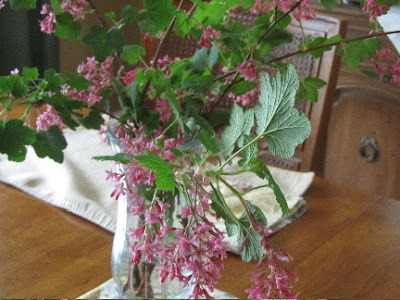 The cherry blossoms on the dining room table faded and were replaced with some branches of red-flowering currant. My son bought his first car. He saved, researched, shopped and found just the right make, model and mileage. He paid cash, and bought a 3 year old Prius, for his daily commute to and from work. And, he shopped around for a good deal on insurance, and maybe found his dad and I a new company (it's time for us to shop around for insurance, too). I began hardening off the tomato seedlings that I started from seeds. They'll be ready to plant under a row cover in another 2 weeks. 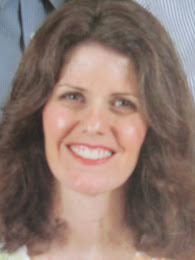 My husband began taking out some overgrown shrubs, that we were going to hire out the work for, saving us about $200, (after cost of renting a chain saw). And I can already see that this year's strawberries and raspberries will get a better dose of sun. I got the laundry rack out again. I looked it over. The metal supports need de-rusting. Last summer that sounded like too much work. This year, I think I can do it in the next few weeks. But I've been using the rack to dry several loads of wash, anyway (just avoiding the rust areas). 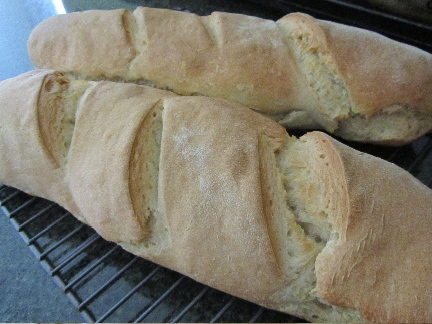 and I baked two loaves of San Francisco sourdough. I had music playing in the background, from a small kitchen radio. It's just a little thing, but it was soothing. I hadn't had music on regularly since the holiday season. 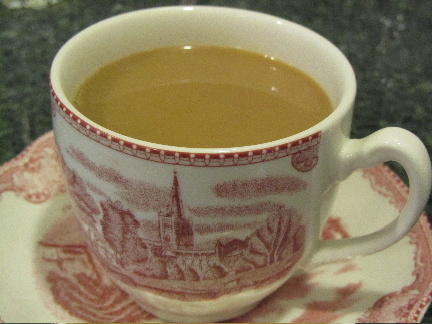 I made myself a hazelnut latte one afternoon, when I was really needing a pick-me-up. 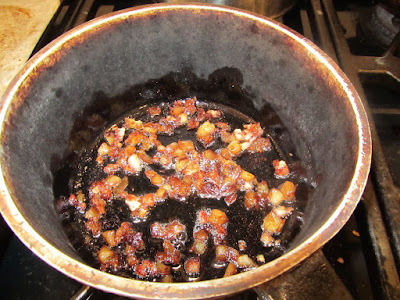 I have a bottle of hazelnut syrup in the cupboard that needs using up. This seemed like a good day for it. (File this one under odd things I do so that I will appear to be "more normal" to outsiders.) I ran out of liquid hand soap for the kitchen sink. Our family has just been using liquid dish soap for the last week. 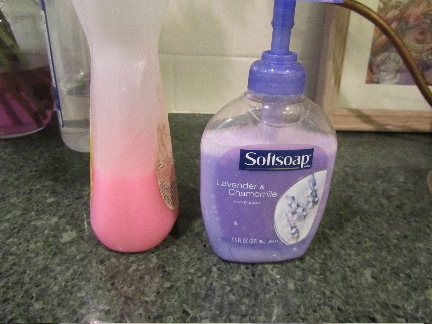 So, I poured some of the dish soap into the hand soap dispenser, but it looked too neon pink. I diluted it with water, still too pink. So, with about 20 minutes to spare before my son's friends would begin to trickle in (they use our kitchen to cook their dinner every Sunday evening), I did a little fix-up job on the dish soap. The label on the soap dispenser says "lavender and chamomile", so that was my inspiration. I got out the blue food coloring and stirred a bit in. Perfect color. Then I added some lotion. Great feel on the hands. Next I dropped in a few drops of lavender soap fragrance. Beautiful fragrance. And finally, as I had added water at one point in the beginning, my creation was a bit too thin, so I worked in some thick hand cream. This is such a nice hand soap to use now. 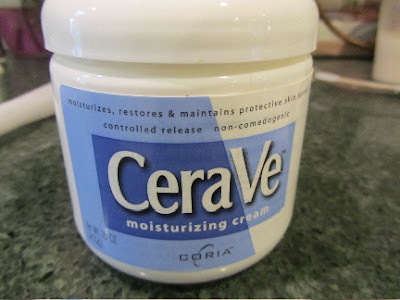 It cleans my hands without stripping the oils. I may just continue to "make" this hand soap in the future. The tulips on the deck are just now beginning to bloom. Aren't spring flowers wonderful?! How about you? What's new at your place? How did you take out the roots to the shrubs? We often find that a problem when we remove trees and shrubs. It takes a lot of work. You're right, that's no easy task. One of the shrubs my husband was able to take the trunk off close to the base, as it was skinny enough. The other, with a much more substantial trunk, he said he would work on it with an ax and shovel. Sometimes he takes out the really large stumps by digging them out. Other times by chopping them off in sections. This one, because of it's location, we may have our tree cutter use his larger chain saw to take down lower, when he comes out to trim back a couple of trees hanging over the house. The stumps will be in a planted area, so it would be okay to just leave a low stump, and allow it to be hidden by plants. And we won't worry about the roots. If they sucker, we'll just keep chopping them off. We have had large stumps ground in the past, if the stump would be in a place where we didn't want it visible. You are very resourceful, Lili. I never would have thought to add food coloring to hand soap, it doesn't stain? And your son is one amazing saver, to have saved enough to purchase a Prius, even used, is fantastic, you have taught him well. 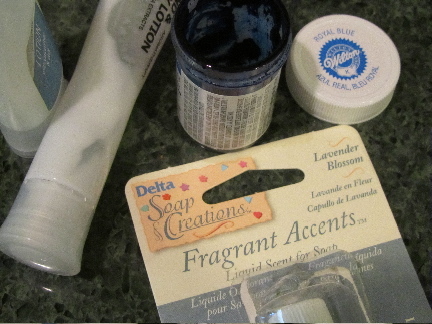 After I added the food coloring I realized I could have just used some soap colorant that I have in craft supplies. But the food coloring worked great. So far, it doesn't appear to be staining anything. I'll let you know if my fingernails or the hand towel begins to take on a bluish cast. I don't think I added all that much color, about as much as in pastel frosting. My son has been working in his career field for a couple of years now. He took the bus to work every single day during this saving time. He's very determined. When he sets his mind to something, he makes it happen. Now I'm quite jealous of the MPG he's getting in his car! He got over 50 MPG to and from work yesterday. That would be soooo nice with my 1 hour commute in the morning and afternoon, with my daughters's school. Oh well. I'm also quite impressed with the Nissan Leaf, all electric. I have seen a couple of those around town. Would be nice! Sounds like you are enjoying spring! I'm trying to get my household back to normal now that spring break is over. My 9-year-old son vaccuumed for me last week, bless him, and my daughter helped clean the bathroom sinks, but I suspect it's time for a mom-cleaning job. :) I spent my morning running errands. Not very exciting, but the mundane can be good. You know, after a school break, it always takes me a couple of days to readjust. I find it hard and I'm more tired, so kudos to you for getting the house back in order. How sweet of your kids to help with chores! But I totally get it, sometimes mom needs to get in there and really clean afterwards! When my kids were younger and I was teaching them how to clean, I just kind of figured they would be in a training period for a long time, and I tried not to expect the kind of job that I would do (easier said than done, right). It sounds like your week is off to a very productive start! In the fall I "winterized" muy back porch. This week I "Springized" it. unpiled and cleaned all the furniture, brought the coushions out from under my bed, arranged a seating area and an eating area. swept away all the spider webs. with that all done I hung out my first load of laundry for the season. I'm happy with GuideOne insurance. They have lower rates because they only service non-drinkers. My agent is in Lynnwood. Way to go, Frugal Spinster! I've been trying to get my deck in shape for spring and summer, but am finding this to be a big job. Now you can just enjoy your porch, once the nice weather returns! Thanks for the info on GuideOne insurance. I hadn't heard of them. This is very good to know about! You are such a creative and inspiring soul! 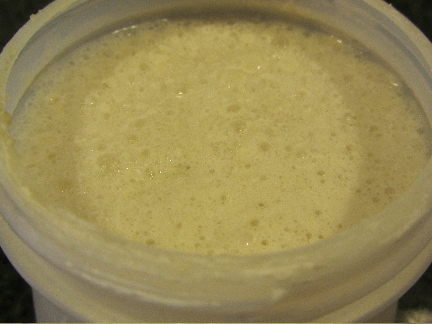 Your sourdough bread looks delish-I can almost taste it with a nice dollop of butter on top! I love your red-flowering currant it matches your china! You always make your home so warm and inviting. Thank you. Mmmm, real butter on homemade bread is always a favorite around here. I love your soap creation! It sounds like one of the science projects my best childhood friend and I would come up with... only this one has purpose and function, rather than just concocting for the sake of concocting! I'm sighing looking at those beautiful blossoms. The thermometer reads 15 degrees right now, and they're saying it's supposed to get down into the single digits. Oy! I'm glad I gave my pea and spinach seedlings an extra blanket, and I'm hoping that the 4 inches of snow will provide enough insulation to protect them! I am hoping that your cold blast melts away as quickly as it came. "Seldom driver discount" -- there really ought to be something along those lines! The hand soap -- that's just me fixating on trying to appear normal. But it did turn out very nicely. Great that you're getting some money back on your insurance. I hope that your next premium will show a good rate as well. Your bread and tulips look wonderful! Thank you! 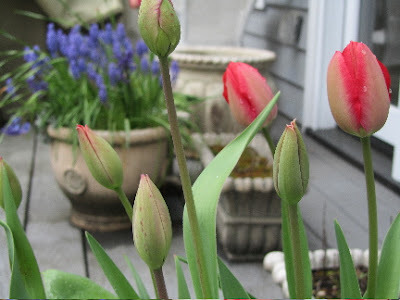 I moved the pot of tulips so that it's right front and center of the window in the family room. I don't want to miss a minute of their bloom! I hope that spring is coming to your area soon!